Three birthdays within six weeks has always been something of a challenge in my household, but an enjoyable challenge. This year, of course, it’s different. I think the conventional notion of one year of mourning still makes sense, the idea that one has to go through a whole cycle of seasons experiencing every recurrent event for the first time without a loved one – holidays, anniversaries, the first ice cream in summer, the first snow in winter, birthdays … I also think the number three is significant: after the first three months, the initial shock begins to subside, allowing pain to be felt that would have been unbearable before, but now starts to gradually emerge as the numbness recedes. This year’s birthday season, the first time without Peter, started three months after his death. When Paddy turned ten, he said he was happy to finally be a two-digit person too, a statement that especially delighted Amy, who was happy to point out repeatedly what this indicated about the interesting way her darling nephew’s mind works. 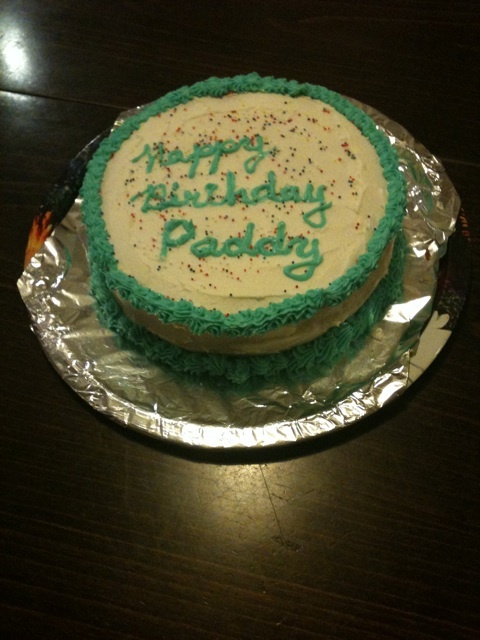 As Paddy entered the second decade of his life in February, I found myself remembering when he became a two-digit person and became determined to make the kind of birthday cake for him again that he liked half his lifetime ago. It was probably not a very sensible plan, but I was feeling unhappy about his mother’s failure to provide the one birthday present he actually asked for, the finished jacket that we started sewing together in September, and about his father’s failure to be alive and present to celebrate with a last-minute surprise, as Peter always did best. The first hurdle to providing an American-style decorated cake with fluffy sweet icing was that the plain cake recipe we had always used was in an American cookbook that has now gone to live in Vienna. I found a recipe for “Amerikanische Biskuitkuchen” in an Austrian cookbook from the 1920s, which seemed promising, even though it calls for more eggs than flour, and proceeded to make an elaborate mess in the kitchen for an entire day. In my mind, I could hear Amy laughing at me (remembering the first time I had to make a birthday cake for Paddy without consulting Amy), pointing out that there is a reason why Americans use packaged mixes for cakes. At the back of my neck, I could feel Peter rolling his eyes, shaking his head and refusing to take any responsibility for cleaning up the mess I was making. I suspect this recipe is also based on the experience of baking cakes in a wood-burning stove, which doesn’t translate well to a modern electrical oven, so it took several hours longer to bake it, but eventually it was finished. Transporting this cake to Vienna without squashing it, especially along with the bulky birthday present of sheets and a blanket I got for Paddy’s beautiful, newly self-built bed, would not have been possible without Seth, but the cake actually arrived in Vienna the next day with minimal damage. Celebrating Paddy’s birthday in Vienna with his wonderful friends felt good, felt right. The cake was probably mostly a sentimental effort on my part, something I needed to do, but Paddy graciously refrained from pointing that out, and I was happy to see him happy. After my week in Ljubljana, where it felt so good to just be myself for a week, taking a holiday from being Peter’s widow, I returned to Linz with more energy and confidence. Unfortunately, however, I could already see my own birthday looming then. I tried hard to resist the temptation to slide into gloomy self-pity, knowing that for the first time there would be no roses and fresh rolls for me in the morning, but since I had a class at nine that morning, I wouldn’t have had time to enjoy them anyway. Peter’s family was incredibly sweet and generous about making a nice birthday for me the Sunday before my birthday, Paddy and Christopher and our new friend Agnes came from Vienna, Seth came on the tram, and we all went out for lunch together and came home for coffee and Oma’s famous celebratory nut-cake. After my class the next morning, Sophie and George took me out for another nice lunch and then accompanied me to the cemetery. Since Peter didn’t bring me roses this year, I took one to him. While Sophie kindly went to get a candle, because I had stupidly forgotten to bring one again, I enjoyed telling George about Peter, while George made contented little burbling noises in his buggy. As soon as Sophie returned, however, of course George realized that he was absolutely famished and urgently needed to be fed. Immediately! Since it was a bit too chilly to sit outside on a bench in the cemetery, Sophie and I made our way back to the main building as quickly as possible, while George protested the delay with all the vociferous insistence that a person just seven weeks old is capable of. The same cheerful man who had accompanied us, when we took the urn to place it in the niche in November, then cheerfully led the three of us into the same room, where we had met with the officials from the cemetery to discuss Peter’s funeral. It is a comfortable, peaceful room, and sitting in that same room again, this time with Sophie and George, felt good, it felt right. Since I am fortunate enough to share the same birthday with two friends, the three of us met in the evening at Solaris to celebrate together and spent a comfortable, enjoyable evening with friends who came to join us. There was no need for self-pity at all, because there was no need to feel lonely the whole day, so the next time will be easier. 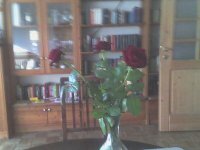 And I didn’t even miss the roses, because I enjoyed bringing them myself for the other two. Two birthdays successfully passed, one to go: March 28th would have been Peter’s fiftieth birthday. He had been looking forward to it, and after I assured him that I had no intentions whatsoever of organizing another surprise party, as I did for his fortieth birthday, he was enjoying thinking about how he would like to celebrate, all the people he would like to celebrate with, thinking more and more about spreading celebrations across the whole week to fit everyone in. Whenever he started thinking out loud about ending up with a party in a little cabin high in the mountains, I asked him whether he was sure he really wanted to celebrate his fiftieth birthday without me. He always just laughed then and promised that he would organize a helicopter especially to get me up to the mountain cabin. It was a helicopter that brought my love’s broken body down from the mountains, but his life was left behind. No helicopters for this birthday then. Instead, the boys and I agreed to hold a kind of open house on Peter’s birthday, so that people who are thinking about Peter, missing him, remembering him, can come by any time starting in the afternoon until open end, to share stories, memories, music, tears, laughter and all our different experiences of how life goes on. Waking up this morning with the thought of seeing lovely friends later today already felt much better than starting the day with a feeling of emptiness. So far, it feels good, feels right, and that is very reassuring.